Tour Normandy with a private D-Day tour from Caen (Normandy) to see the sites of World War II. Meet your driver guide when you arrive by train in Caen Normandy. The Normandy private tour from Caen itinerary is flexible, but this is our suggested itinerary. Your first stop is Sainte Mere Eglise. This is where units of the U.S. 82nd Airborne and U.S. 101st Airborne Divisions landed early morning on June 6, 1944. Grave of Theodore Roosevelt, Jr.
Utah Beach is your next stop. The U.S. 4th Infantry Division landed on Utah Beach on D Day. Of particular interest is the fact that Brigadier General Theodore Roosevelt, Jr., assistant commander of the 4th Division, was the only general to land with the initial seaborne assault wave on D-Day, coming ashore in Schroeder’s LCVP. At age 57, he was the oldest soldier to land. General Roosevelt was the oldest son of President Theodore Roosevelt and was a Medal of Honor recipient. He was a distinguished soldier who fought in both WWI and WWII and is buried at the American Cemetery above Omaha Beach. The next stop on your D-Day tour is Pointe du Hoc, where members of the United States 2nd Ranger Battalion scaled the cliffs to attack a German gun battery. 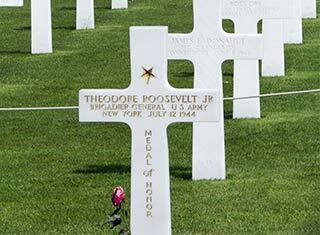 Your D Day tour continues to Colleville-sur-Mer and stops at the American Cemetery, which overlooks Omaha Beach. You will want to explore the Visitors Center and then walk the American Cemetery. If time permits, walk down the path from the American Cemetery to Omaha Beach. Then your private Normandy D-Day tour will stop at the German artillery battery at Longue-sur-Mer. You will continue to Arromanches to see the remains of Churchill’s Mulberry Harbor at Gold Beach. If you want to visit the Bayeux Tapestry, let us know and the guide will take you there. This tour can also be enjoyed from your Normandy hotel, if you are staying in Normandy for several days. 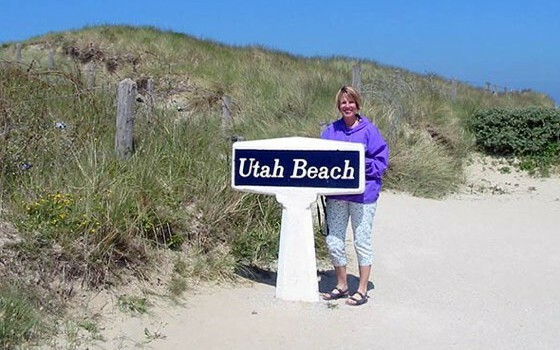 If you wish a private Canadian D-Day tour , we can arrange to visit Juno Beach where the Canadians landed on D-Day and Sword Beach where the British landed. A Canadian tour could visit the Canadian Military Cemetery at Beny-sur-Mer and the Ardenne Abbey. Entrances and meals aren’t included in the cost for the private tours. A private Normandy D Day tour from Caen will leave you with lasting impressions about the Battle of Normandy Invasion on June 6, 1944.